Gov. Jerry Brown was on KQED Forum today discussing the recently signed regional pact with Oregon, Washington state, and British Columbia to fight global warming. ... environmentalists lashed out at Brown for his full-throated support(of) fracking, the controversial practice in which oil and gas companies inject water, sand and chemicals into the ground to fracture underground rock formations and release huge amounts of fossil fuels. Those are the very substances that scientists say are causing more global warming. 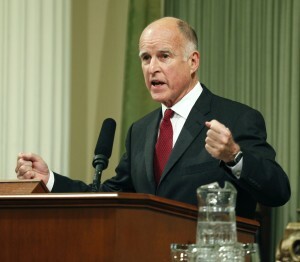 Forum host Michael Krasny asked Brown about the issue, and in characteristic fashion, the governor didn't mince words. Krasny: Critics are saying, "Can you really have a meaningful climate change pact if you don’t address fracking?" Brown: The premise of that assertion is that climate change is primarily about fracking. And that’s the most absurd idea I’ve ever heard. The key point here that most people have in their minds is fracking the Monterey shale. Nobody’s doing that. At best it’s several years if it ever happens. And it can’t happen until a major and the first serious scientific study to an environmental impact analysis that I required by a law I signed two months ago is done. I’m supervising that analysis and we’re going to find out. Some of these fracking people, I talked to one young lady, I said, "Give science a chance." [She said,] “No, I don’t’ need that, I studied it in college." She did not study fracking the Monterey shale in college, because it has not been studied in any serious way before. But it will, and there will be plenty of time to make comments, the state will have to respond to each of the hundreds of thousand of comments. This is a big deal, and the fact that people have just pretended not to see it as a big deal, shows you the utter emptiness of some of the political debate today. People don't know what the hell they’re talking about. People often say fracking is an issue that requires the classic question: is the glass half-full or half-empty? Well, the Earth's atmosphere is completely full. And we’re going to have to make a shift to renewable energy sources. We have the ability to do that. The report came out recently that last year the largest new additions to electricity production in the U.S. came from wind -- 42 percent of all new energy production from wind. In Australia, wind energy, a report says, is now cheaper than electricity from a new coal plant or a new gas plant. And solar photovoltaic energy is spreading far more rapidly than anyone thought was possible. In 2010 the world’s cumulative investments in renewable energy for the first time exceeded the world's investments in fossil fuel energy. Now the fracking wave over the last two years has put [non-renewables] out in front again, but it is inexorable that we will shift to renewable energy.